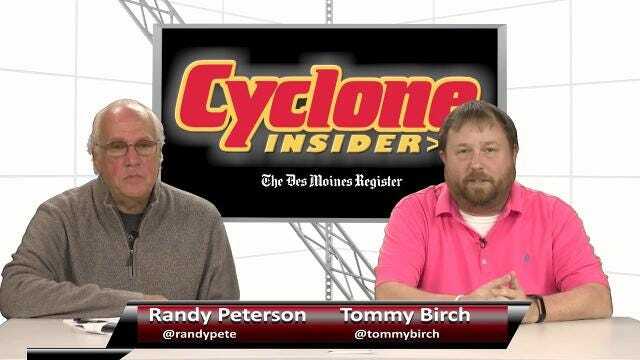 Sports writers Randy Peterson and Tommy Birch break down Iowa State’s matchup against No. 3 Oklahoma. NORMAN, Okla. — It was a busy first half Saturday for Iowa State’s Joel Lanning. The quarterback-turned-linebacker played both offense and defense for the Cyclones, who trail No. 3 Oklahoma, 24-13, at Gaylord Family-Oklahoma Memorial Stadium. The fact the Cyclones are even within striking distance is a shocker. How the Cyclones are doing it is just as crazy. Iowa State has tried to use Lanning as much as possible playing him at his usual spot as the Cyclones’ starting middle linebacker but also mixing him in at quarterback. Lanning can do it all: Iowa State couldn’t afford to take Lanning off the field. The redshirt senior was huge on offense and defense. On offense, he carried the ball four times for 18 yards and threw for 25 yards. On defense, he had three tackles. When Lanning wasn’t at linebacker, redshirt freshman Tymar Sutton filled in for him. Lanning’s biggest contributions came on offense, where he provided a missing spark and element of surprise for the Cyclones. Allen Lazard with no catches: The biggest surprise of the half may be that Allen Lazard had zero catches. Five different receivers caught passes in the first half, but Lazard was not one of them. Kempt gets first start: Redshirt senior Kyle Kempt got his first start in an Iowa State uniform. Kempt replaced Jacob Park who took a leave from the football teamto work through some personal issues. Kempt shared snaps with Lanning. Both had their share of success. Kempt completed 7 of 12 passes for 131 yards. Harvey out: As if Iowa State needed another factor working against it Saturday. The Cyclones defense also took a hit when starting linebacker Willie Harvey didn’t make the trip to Sooner land. Harvey, in his third season starting, stayed back in Ames with an undisclosed injury. In four games this season, Harvey has tallied 31 total tackles. More David Montgomery: After getting just nine carries in Iowa State’s last loss to Texas, fans were demanding to see more of running back David Montgomery. They got their wish. The sophomore finished the first half with eight carries for 19 yards. Montgomery also caught five passes for 78 yards. One of the biggest plays of the half came when Montgomery caught a swing pass from Kempt and zigged-zagged his way around defenders for a 46-yard gain.